Overview Deferasirox: chemical name 4-[3,5-bis (2-hydroxyphenyl)-1,2,4-triazol-1-yl] benzoic acid, is a kind of iron chelator products studied and developed by the Novartis company (Swiss). It was the first routinely used oral iron agent approved by US FDA, allowed to be applied for the treatment of iron overloading caused by blood transfusion in patients (older than 2 years old) of chronic anemia. In Europe, it is recommended as the first-line treatment drug for patients older than 6-year-old who are suffering blood iron overload patients. In China, it is currently subject to clinical research; Ⅱ, Ⅲ clinical trials and pharmacokinetic studies have all shown that it has excellent safety and tolerability, and can significantly reduce the heart, liver iron load, easy to be accepted by the patient. At the same time, it also has pharmacological properties of antifungal (such as Mucor which can grow in iron-ricking environment), anti-cell proliferation, anti-malaria, antioxidant stress injury and anti-cytotoxicity induced apoptosis; it can be used for the treatment of hemochromatosis, delayed skin porphyria and other diseases. Preparation Take salicylic acid as raw material; it undergoes chlorination through thionyl chloride to obtain salicylic acid chloride. Salicylic acid chloride and salicylic acid amide are placed under the condition of high temperature and vacuum distillation instead of ordinary reflux method to obtain intermediates, further evaporating into large amount of low-boiling and by-products through high temperature vacuum distillation, making the mass fraction of the intermediate be increased from 88.7% to 97.5%. 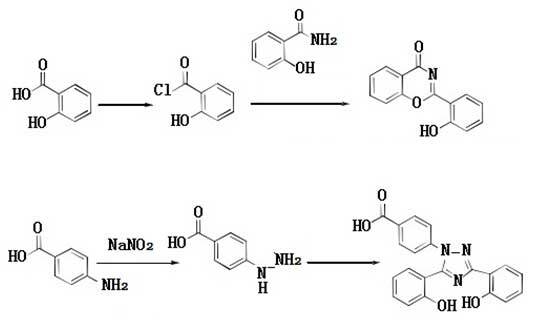 Finally, after the removal of hydrochloric acid, the carboxyl-phenylhydrazine hydrochloride is subject to cyclization with the intermediate to prepare the product of deferasirox, reducing the steps of desalting and solvents steaming-off in the post-reaction treatment while reducing the amount of anhydrous ethanol as well so that the operation becomes simpler. Salicylic acid (13.8 g, 0.1 mol), 10 drops of anhydrous pyridine and 10 mL of thionyl chloride were added to the reaction flask. The mixture was subject to stirred reaction at room temperature for 30 min and slowly heated to 70 °C with stirring until almost no hydrogen chloride gas was released. Further heat to 80 °C and stir for 3 h. Residual thionyl chloride was distilled off under reduced pressure to give a pale yellow liquid which was cooled to precipitate crystals and used directly in the next reaction. Salicylic acid (13.7 g, 0.1 mol) and the compound 1 obtained from the last step of reaction are added to the reaction flask equipped with a distillation apparatus and heated to 180 ° C. The reaction mixture was reacted with distillation under reduced pressure at the same time for 3 h to remove water from the reaction. 50 mL of absolute ethanol was added under melting to precipitate the solid yellow product. After filtration and recrystallization from anhydrous ethanol, we can obtain 16.8 g of a yellow product with a yield 70.3% and mp 210-213 °C. 4-aminobenzoic acid (6.85 g, 0.05 mol) and 10 mL of distilled water were added into a 250 mL three-necked flask. The mixture was stirred to become a paste and added of drop wise of 12.5 mL of concentrated hydrochloric acid at 5 ° C. The solution was cooled to 5 ° C in an ice-salt bath. Upon stirring, slowly add drop wise of a sodium nitrite saturated solution (3.5 g, 0.05 mol of sodium nitrite is dissolved in a small amount of water (8 g)) for diazotization reaction. The reaction temperature is kept below 5 ℃ and further stirred for 30 mins after the completion of dropping. The diazonium salt solution was then poured into a solution with sodium sulfite (25.2 g, 0.2 mol) dissolved in water (100 mL) pre-cooled to 5 °C. Stir at this temperature for 30 min, and heat to 80 ° C for 1.5 h. The orange-red solution will be changed to yellowish. Cool it to room temperature; slowly add hydrochloric acid for acidification to pH 3 to obtain the p-carboxyphenylhydrazine hydrochloride precipitate. Further apply filtration and drying to get 8.3 g white product with a yield of 88.3%. The compound 3 (3.8 g, 0.02 mol) was adjusted to pH 6 with 30% NaOH, stirred, and stand for layering so that the water layers were separated. The oil layer was p-carboxyphenylhydrazine. The oil layer was placed in a flask; add compound II (5.0 g; 0.02 mol) and reflux for 2 h in anhydrous ethanol (75 mL). Cool, precipitate the crystals; filtrate and rinse with 10 mL of ice ethanol, dry and perform ethanol-water recrystallization, to obtain 6.3 g micro-yellow product with a yield of 84.45%. Pharmacological effects DFS has antifungal activity (such as Mucor growing in the iron-rich environment), anti-cell proliferation, anti-malaria, anti-oxidative stress injury, anti-cytotoxicity induced apoptosis and other pharmacological effects. Iron is a substance that fungi rely on, and plays a very important role in the growth and toxicity of fungi. The antifungal effect of iron chelator may be due to their effect of removal of the iron necessary for fungal growth, so as to achieve the purpose of treatment of fungal infection. Iron plays a very important role in the process of cell proliferation. Iron chelators may have anti-proliferative properties, suggesting that iron chelators may be a novel anticancer agent for the treatment of tumors. Pharmacokinetics DFS is a tridentate iron chelator that binds ferric ions in a 2: 1 ratio to form complexes that are excreted from the feces, reducing the storage of iron in the body. As DFS persists in plasma, the plasma non-transferring binding iron can be continuously reduced, thus directly eliminating the iron toxicity formed in vivo. The main metabolic pathway of DFS is via glucuronidation for producing metabolites M3 (acylglucuronide) and M6 (2-O-glucuronide). Administration of large-dose DFS may present some acute adverse reactions, such as gastrointestinal symptoms (15%) and rash (11%). However, patients who finally discontinue the drug treatment due to these symptoms are rare. Side effects For patients with renal insufficiency, DFS can lead to increased creatinine levels with 38% of patients getting creatinine levels increased by 33% or more. But DFS-induced creatinine increase will generally not exceed the normal upper limit and there has not yet been progress in renal disease reported. After a reduction in DFS, creatinine levels returned to normal or remained stable in 13% of patients. <1% of patients can get hearing impairment (hearing loss, hearing reduction) and ocular diseases (lens opacities, cataracts, elevated intraocular pressure and retinopathy), and therefore it is recommended to participate into hearing and visual capability examination (including slit lamp examination and fundus examination)annually before and during the period of iron therapy, once found, it should be considered to disable DFS. Common side effects of deferasirox in Chinese patients with thalassemia include: rash, abdominal pain, diarrhea, and elevated transaminase level and serum creatinine level; mostly mild with no serious adverse reactions. Deferasirox can cause renal damage and gastrointestinal bleeding, and therefore it is recommended to detect 2 times of creatine clearance rates before the treatment; detect once per week during the initial stage of treatment, followed by once per month. Gastrointestinal bleeding is a common adverse reaction of this drug that can be fatal in older patients with advanced malignancies or thrombocytopenia, and these patients are unlikely to benefit from the treatment with this drug. Deferasirox may lead to serious adverse effects of liver failure. The patient must subject to regular monitoring of liver function during the medication process. If there is difficult to explain, persistent or progressive increase on the serum aminotransferase levels, we should adjust the usage or withdraw the drug. Uses 1. DFS can be used to treat the reversible renal insufficiency caused by Fanconi syndrome. 2. It can be used for the treatment of secondary hemochromatosis. 3. It can be used for the treatment of delayed skin porphyria. 4. It can be used for the treatment of myelodysplastic syndromes. Precautions Patients with allergy to deferasirox are disabled. Description Iron overload is a potentially life-threatening cumulative toxicity that occurs frequently in patients who receive multiple blood transfusions for the treatment of certain types of chronic anemias such as thalassemia and sickle-cell disease, as well as for the treatment of myelodysplastic syndromes. Progressive iron overload, if untreated, often causes injury to heart, liver, endocrine organs, joints, and other target cells and tissues. Iron overload is treated by administration of iron chelators, which mobilize the iron deposits into soluble complexes that can be excreted from the body. The current standard of care in iron chelation, deferoxamine (Desferal ? ), is effective, but typically requires subcutaneous infusion lasting eight to twelve hours per day, for five to seven days a week for as long as the patient continues to receive blood transfusions. In many patients, the need for transfusion and chelation therapy may be life-long. This has resulted in low patient acceptance of the product. Deferipone is an orally available iron chelator that has been marketed in certain parts of the world; however, it has a short duration of action and may be associated with serious side effects. Deferasirox is an orally active tridentate ligand that binds iron with high affinity in a 2:1 ratio. The recommended dosage is 20 mg/kg of body weight once, daily. Deferasirox is synthesized in two steps starting from salicylamide, by first condensing with salicyloyl chloride to afford 2- (2-hydroxyphenyl)benz[1,3]oxazin-4-one, and subsequent reaction of this intermediate with 4-hydrazinobenzoic acid. Deferasirox is rapidly absorbed following oral administration, reaching peak plasma concentrations at 1.5–4 h. The Cmax and AUC increase approximately linearly with dose after both single administration and under steady-state conditions. Deferasirox is highly protein bound (99%), almost exclusively to serum albumin. It has a volume of distribution at steady state of 14.37±2.69 L, mean elimination half-life ranging from 8 to 16 hours, and oral bioavailability of 70%. Glucuronidation is the main metabolic pathway for deferasirox, with minimal oxidative metabolism by CYP450 enzymes. Deferasirox and metabolites are primarily excreted in the feces via the bile (84% of the dose). Clinical trials involving more than 1000 adults and children demonstrated that deferasirox, at 20–30 mg/kg/day led to maintenance of or reductions in liver iron concentration, an indicator for body iron content in patients receiving blood transfusions. The most frequently reported adverse events were transient in nature and included mild to moderate nausea, vomiting, diarrhea, abdominal pain, and skin rash. In addition, patients treated with deferasirox experienced doserelated increase in serum creatinine at a greater frequency compared with deferoxamine- treated patients (38% vs. 15%, respectively). However, most of the creatinine elevations remained within the normal range. As with deferoxamine injection, deferasirox was associated with a low incidence of ocular and auditory disturbances. Uses Labeled Deferasirox, intended for use as an internal standard for the quantification of Deferasirox by GC- or LC-mass spectrometry. Definition ChEBI: A member of the class of triazoles, deferasirox is 1,2,4-triazole substituted by a 4-carboxyphenyl group at position 1 and by 2-hydroxyphenyl groups at positions 3 and 5. An orally active iron chelator, it is used to manage chronic iron overload in patient receiving long-term blood transfusions.